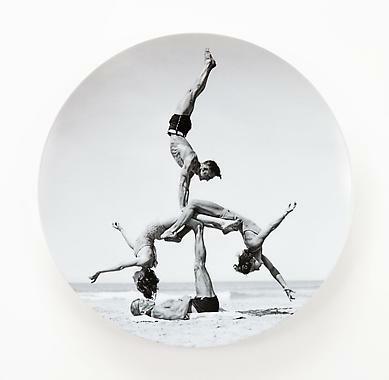 Jeff Koons Plate Edition with Bernardaud - SOLD OUT! 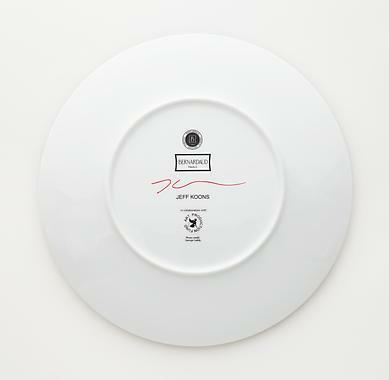 Art Production Fund is pleased to present our second WOW plate edition designed by Jeff Koons. We are proud to partner in this series with Bernardaud, the renowned crafter of fine Limoges porcelain tableware, interior design and jewelry collections. WOW (Works on Whatever): Jeff Koons plate edition is part of Art Production Fund’s WOW project; a unique collection of everyday items designed by artists. APF invites artists to experiment with the latest commercial materials and techniques to bring art off the walls and into homes as everyday objects. WOW introduces contemporary art to a larger community, with revenues from sales supporting our non-profit mission. WOW functions conceptually with APF’s program of expanding art audiences and helps fund additional major public art initiatives. For each plate purchased, APF will make a donation to the Koons Family Institute, a resource of the International Centre for Missing & Exploited Children. Jeff Koons was born in York, Pennsylvania in 1955. He studied at the Maryland Institute College of Art in Baltimore and the School of the Art Institute of Chicago. Koons’ work is in numerous public collections, such as the Museum of Modern Art, the Whitney Museum of American Art, the Guggenheim Museum, Los Angeles County Museum, The Broad Art Foundation, San Francisco Museum of Modern Art, Tate Gallery, London, and the Museum of Contemporary Art, Tokyo. Koons’ work has captivated audiences and inspired controversy since the 1980s, making him perhaps, the most famous artist of our time. Bernardaud --- a family owned-and-operated company founded 1863 in Limoges, France ---is recognized worldwide for its commitment to the French traditions of refinement and creativity in the crafting of porcelain tableware and interior design pieces. Using only the finest materials and artisan talent, each Bernardaud object is imbued with unrivaled luminosity, beauty and durability. The innovative company is a trendsetter and recurrently collaborates with artists, designers, architects and even chefs to create unique items that elegantly fuse design art and lifestyle. Bernardaud has previously partnered with such artists as Roy Lichtenstein, Cindy Sherman, George Segal, Joseph Kosuth, Arman, César, Pae White, and James Brown.